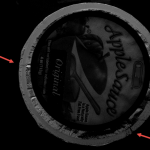 Using statistical sampling inspection is not enough to determine whether a cup is likely to become a “leaker”, whereby it contains small channels within the foil lid such that air can get in (spoiling the product) or applesauce can get out, causing a mess and returned product. If a customer detects leakers, an entire shipment may be returned for additional inspection or replacement. 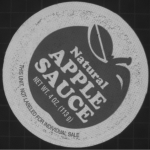 In addition, an off-center lid may become a leaker if the edge of the lid is not fully sealed and, of course, holes in the foil lid will cause both spoilage and leakage. 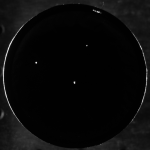 Finally, it was too easy to apply the wrong lid, in that the machines are loaded by hand, and similar-looking lid graphics were causing issues with shipping the wrong lids to the wrong customer. 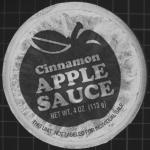 1.Whether the foil lid seal area has any bubbles, folds, or “channels” such that the containers may become leakers or seal problem may lead to product spoilage. 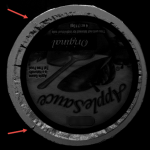 Using this foil lid inspection system, the client can detect, address, and resolve upstream lid-application problems quickly, before hundreds of defective cups are produced. By ejecting potential problem cups, distributor and customer satisfaction are improved. Click Here to more learn about VAIA’s expertise in the Food & Beverage Industry. Like to learn more about this Case Study? Submit your information below. You’ll receive additional information and the Case Study in PDF.